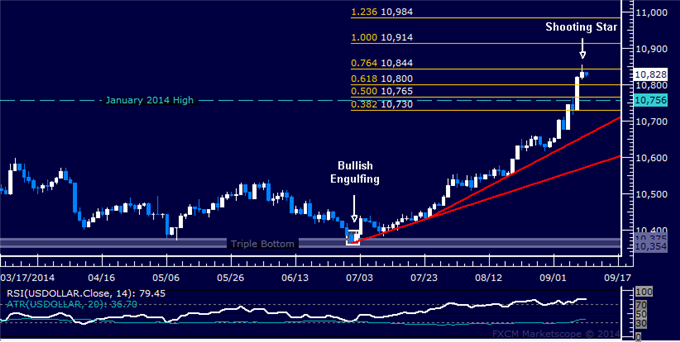 -After flirting with the line that extends off of the 2011 and 2012 lows for 3 weeks, the USDOLLAR found legs and trades just shy of the 50% retracement of the year’s range and 200 SMA. The bullish outside month in July is a good way for long term USD strength to resume but the current level likely inspires consolidation / pullback. 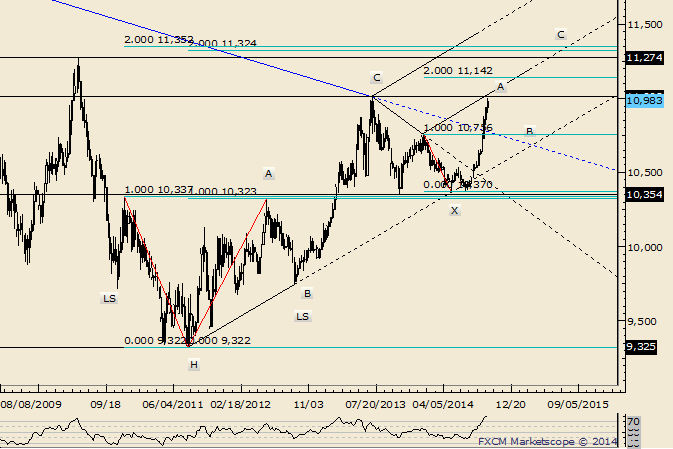 Expect 10470 to hold if the larger trend is indeed higher. -After flirting with the line that extends off of the 2011 and 2012 lows for 3 weeks, the USDOLLAR found legs and trades just shy of the 50% retracement of the year’s range and 200 SMA. The bullish outside month in July is a good way for long term USD strength to resume. -10682 (50%) is in focus now. The year open is at 10668. I’d be surprised if a sharp pullback didn’t materialize from near 10690. The Dow Jones FXCM US Dollar Indexmay be preparing to turn lower after putting in a Shooting Star candle having set a new 2014 high. Near-term support is at 10800, the 61.8% Fibonacci expansion, with a break below that on a daily closing basis exposing the 10756-65 area marked by the January 2014 high and the 50% level. Alternatively, a push above the 76.4% Fib at 10844 opens the door for a challenge of the 100% expansion at 10914. 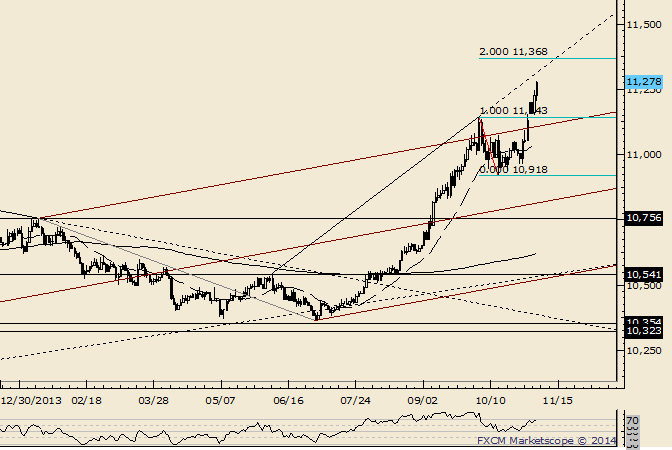 The Dow Jones FXCM US Dollar Indexmay be carving out a top as negative RSI divergence warns of ebbing upside momentum. A daily close below rising trend line support at 10931 exposes the 14.6% Fibonacci retracement at 10869. Alternatively, a reversal above the 14.6% Fib expansion at 10957 clears the way for a test of the 23.6% threshold at 11008. 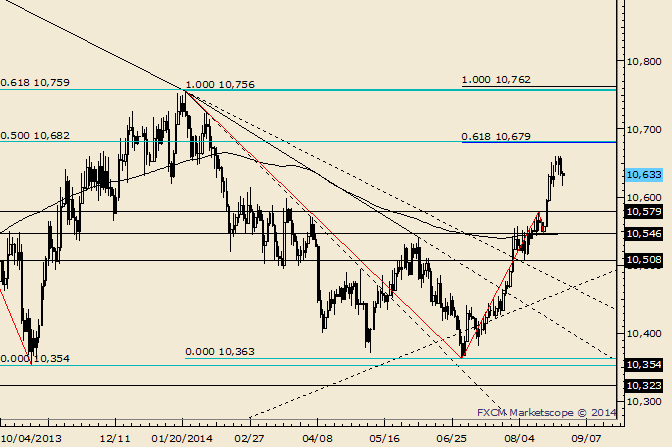 -A double bottom with the October 2013 and July 2014 lows in USDOLLAR was confirmed on the push above 10756. The pattern’s objective is 11142 but extreme momentum and sentiment does give scope to a period of weakness in order to reset the market for its next advance. Estimated support is 10815. A longer term target zone is 11324/52. 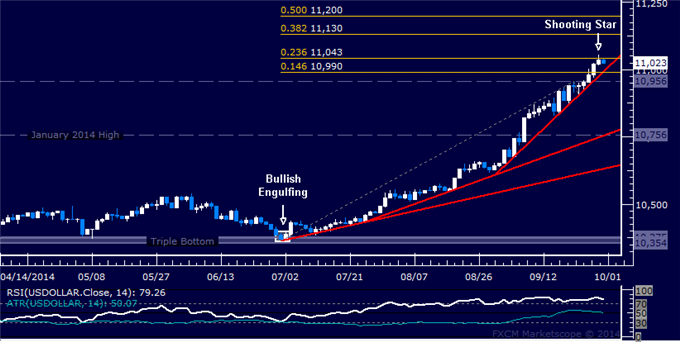 US Dollar Technical Analysis: Is a Pullback in the Cards? 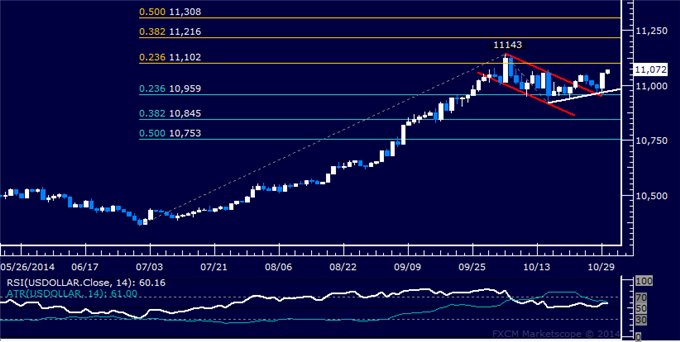 The Dow Jones FXCM US Dollar Indexput in a Shooting Star candlestick, hinting a pullback may in the cards. 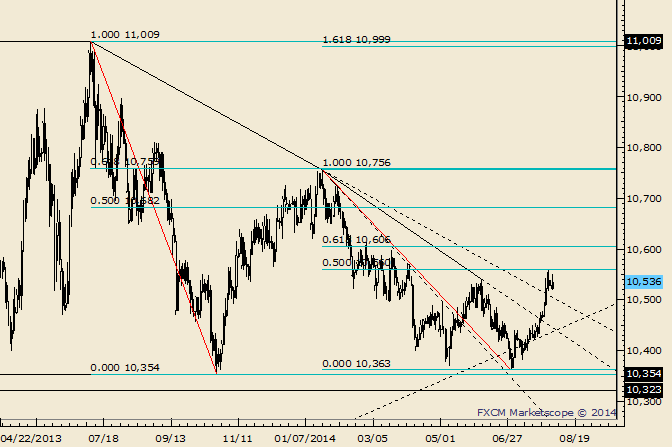 Near-term support is at 10990, marked by the intersection of the 14.6% Fibonacci expansion and a rising trend line. A break below that on a daily closing basis exposes the September 22 high at 10956. Alternatively, a push above the 23.6% level at 11043 opens the door for a challenge of the 38.2% Fib at 11130. The Dow Jones FXCM US Dollar Indexmoved lower as expected after producing a bearish Dark Cloud Cover candlestick pattern. A daily close below falling channel bottom support at 10890 exposesthe 38.2% Fibonacci retracementat 10845. Alternatively, a turn above the channel top at 11044 clears the way for a test of 11143, the October 3 high. The Dow Jones FXCM US Dollar Indexlooks to be resuming its advance as buyers try to find follow-through on a Flag pattern completed last week. Near-term resistance is in the 11102-43 area marked by the 23.6% Fibonacci expansion and the October 3 high, with a break above that on a daily closing basis exposing the 38.2% level at 11216. Alternatively, a reversal below the 10959-71 area (23.6% Fib retracement, trend line) opens the door for a challenge of the 38.2% threshold at 10845. -Reset for the next move higher indeed as the USDOLLAR is now at its best levels since May 2009. The expansion of the 11143-10920 range is 11365. 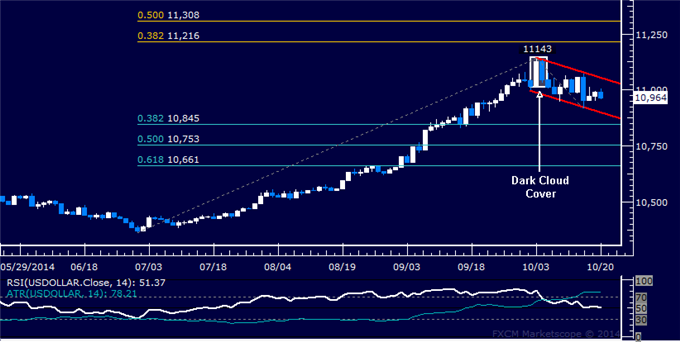 The Dow Jones FXCM US Dollar Indexmay be topping having hit a five-year high following the formation of a Shooting Star candlestick. Negative RSI divergence bolsters the case for a downside scenario. Near-term support is at 11278, the 14.6% Fibonacci expansion, with a break below that on a daily closing basis exposing the November 17 low at 11219. Alternatively, a turn above the 23.6% level at 11315 opens the door for a challenge of the 38.2% Fib at 11374.